For those who are not fully up to speed on the current trends and predilections among Portugal’s A-listers, let us shed a little light. Comporta, a casually chic beach destination located an hour’s drive south of Lisbon amid the rice fields and forests of the Tróia peninsula, has been garnering comparisons with Ibiza — and, perhaps more aptly, with Uruguay’s José Ignacio. There are high-end boutiques and rustic beach bars, beautiful people stretched out on chaises longues, restored fisherman’s cottages available for rent; it’s frequently been referred to as “Cool Comporta,” and only partially because alliteration is what headlines are made of. 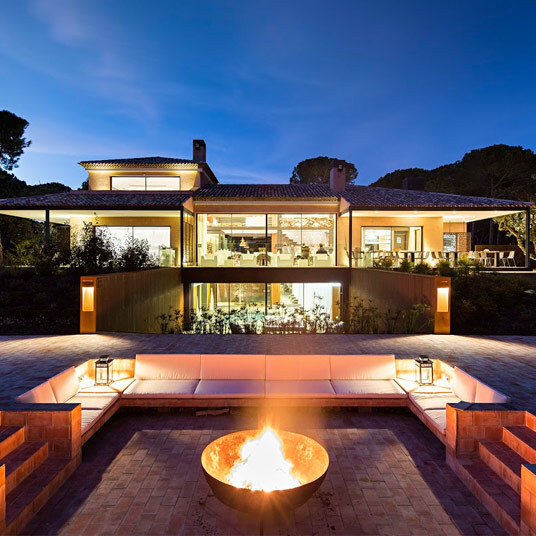 With a name like Sublime Comporta, this high-end country retreat is hardly underselling itself. But the aesthetic is more classic, the look and feel more elegantly restrained, than you’d expect. The hotel is located on a 17-acre estate dotted with umbrella pines; the place is partly powered by solar energy. There are only 14 guest rooms and suites, five of which are located along the corridor of the main building. The so-called Friends Rooms look starkly modern at first, due to the concrete floors and crisp white and light gray color palette, but on closer look, the soft cotton sheets and a few design accents — a bedside table made of petrified wood, a lived-in armchair — reveal a subtle coziness. Each room has floor-to-ceiling windows and sliding glass doors that open onto private wood-planked patios. Located in an adjacent building, larger Guests Suites have a similar look, with open floor plans, modern bathrooms located on mezzanines, and sofa beds that open to accommodate one adult or two children. The Owner’s Suite, with its unique wood headboard and contemporary fireplace, is the hotel’s largest, and it’s most visually striking. At the Sublime restaurant, daily tasting menus are inspired by traditional Portuguese cuisine, but the dining room is just as minimalist as any other space in the hotel — here, as in the guest rooms, the architecture seems designed, Frank Lloyd Wright–style, to draw the eye outdoors. And outdoors is where you’ll mostly want to be, of course, drinking wine around the sleek fire pit, or lounging beside the swimming pool, or wading into the Atlantic at the beach nearby. Kindly note that children under the age of 10 cannot stay in the Guest Suites. Access to the SPA is reserved for guest 16 years or older. Baby cots and extra beds are not available. Please contact CustomerService@TabletHotels.com for assistance. No pets allowed. Cancellation policy: We require your credit card details in order to guarantee the reservation. We will pre-authorize the credit card or charge the deposit according to season. On normal season: Reservations cancelled or altered with more than 7 days notice are without penalty to the guest; Cancellations with less than 7 days before the arrival have a penalty of 100% of the total booking. On high season: Reservations cancelled or altered with more than 14 days notice are without penalty to the guest; Cancellations with less than 14 days before the arrival have a penalty of 100% of the total booking. To guarantee your reservation, we require a deposit of 30% on the time of booking On special season: Reservations cancelled or altered with more than 21 days notice are without penalty to the guest; Cancellations with less than 21 days before the arrival have a penalty of 100% of the total booking. To guarantee your reservation, we require a deposit of 30% on the time of booking Any changes in the reservation may imply changes in the prices. In case of a no-show or early departure, the full amount of the reservation will be charged. Prepaid - you have the guarantee of the best price, but implies payment at the time of the booking, non refundable and non modifiable. Guest Suites cannot accommodate children under 10 years.